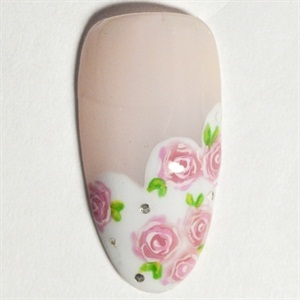 Chris Mans from @Jeweled Nails, a salon and academy in Lake Forest, Calif., shows how he created vintage shabby-chic theme wedding nails with blush as a wedding color. 1. Apply a soft French Pink and white French in a diagonal scallop pattern. 2. 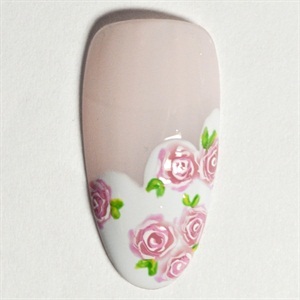 Apply clusters of blush pink on the white free-edge. 3. Use pink and white to paint details in the vintage roses and use green and a little yellow to add small leaves to the vintage roses. 4. 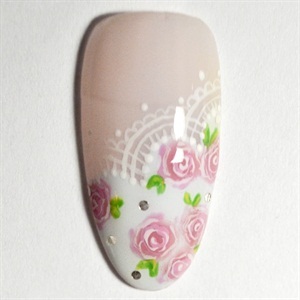 Place small silver hologram dots between the roses on the white free edge. 5. Paint Lace designs along the scallop french line.